Villa Indrani is built in an L-shape around a walled courtyard and set across three floors accessed via a central staircase. The villa is built into a steep slope, with its entrance hall and one of its master bedrooms situated on the top floor together with an open rooftop area. The three guest bedrooms are on the mezzanine floor and the large living and dining space, second master bedroom, along with a separate guest bathroom and the staff quarters are all located on the lower floor. The villa’s two sumptuous master bedrooms - one on the upper and one on the lower floor – are mirror images of each other and exude a lovely old-style colonial feel. Both bedrooms are very spacious and feature desk and dressing areas, along with a large ensuite bathroom with a beautiful stone tub and a monsoon shower. They both have a king-size four-poster bed with a soft white canopy that doubles up as a mosquito net. The three guest bedrooms are located next to each other on the mezzanine floor and are identical. They each have a king-size four-poster bed with mosquito net and an ensuite bathroom with a tub and a rain shower. All three bedrooms have floor-to-ceiling sliding windows, allowing guests to fully appreciate the lovely views over the pool and the surrounding area. Accessed via a large parking area at the villa’s upper level, Indrani’s entrance hall can best be described as monumental: its wooden panelling and sizeable bamboo lampshades provide a great flavour of what’s to come. The villa’s other communal areas are situated on the lower floor. The design of the living and dining space has been kept purposefully minimal, but its subtle furnishings and ornaments nonetheless give it plenty of character. Surrounded on three sides by floor-to-ceiling sliding windows, this space feels very bright and airy. The living area has two very comfortable sofas, an armchair and a large TV with smart speakers. The dining area is furnished with an impressive square table seating eight people. Within the living and dining space, the well-equipped guest kitchen comes with a Simonelli espresso machine – one of the best coffee makers available. Simply ask one of your butlers to make you a perfect brew any time of the day. The chef, however, prepares most of the meals in a separate staff kitchen tucked discreetly away behind. The 10 x 10 metre courtyard pool has a large sun deck with six loungers, as well as a small lawn area. Its whitewashed walls ensure plenty of privacy, while a stunning tree root decoration provides a unique focal point. There’s also a fan-cooled outdoor dining table which seats up to ten people – perfect for brunch or dinner by the pool. On the mezzanine floor a spiral staircase gives access to the rooftop, which makes a great spot for admiring the sunset with a cocktail in hand. Also on the ground floor is a small shrine where staff make their daily offerings. You’re more than welcome to attend one of these intimate ceremonies, or indeed make an offering yourself for good luck (or good times). The staff will be delighted to tell you more about this strongly held Balinese tradition. 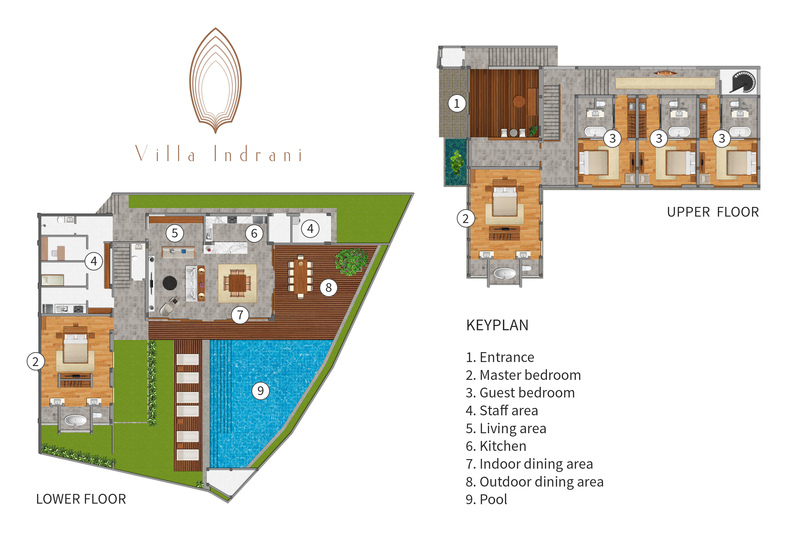 Villa Indrani also has a large parking area just beyond the entrance hall.